BAZAR-KORGON, Kyrgyzstan, June 10, 2011 — The night before he was stabbed and burned to death, a small-town cop named Maktybek Suleimanov brushed off his wife's pleas that he stay home and sit out the commotion on the streets. Suleimanov had wanted to be a policeman ever since he was a kid growing up in this turbulent corner of Central Asia. He'd ask his mother to pin strips of fabric to his t-shirt so they'd resemble rank insignia. Sometimes he'd go so sleep that way. Now Suleimanov was 41 years old, had four kids of his own, and wore real shoulder straps of a police captain. 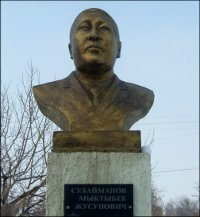 A broad-faced ethnic Kyrgyz with a buzz-cut and a thin mustache, Suleimanov was a gregarious man who liked to sing at family gatherings. He had been a cop for 20 years.